This is the color version of the nametag for the pilots for VFA-87. It goes with the black squadron patch. This is the desert version of the nametag for the pilots for VFA-87. It goes with their desert squadron patch. 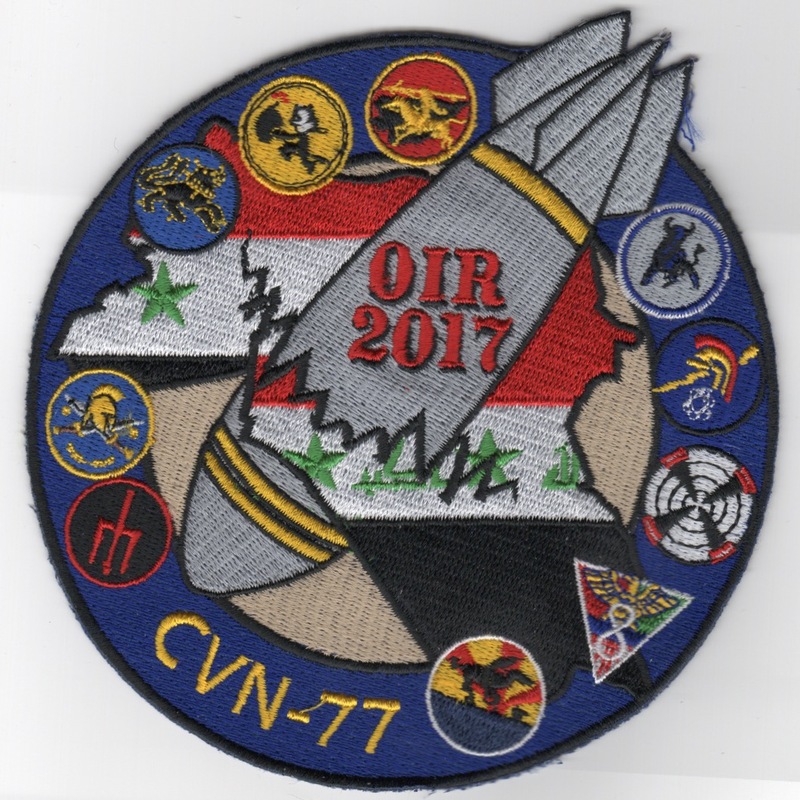 This is one of the 2017 OIR Cruise Patches for CVN-77, Airwing 8, and VFA-87. It shows the 'Gaggle' of squadron logos with a bomb thru Iraq. Only received a few of these...... No velcro on back. 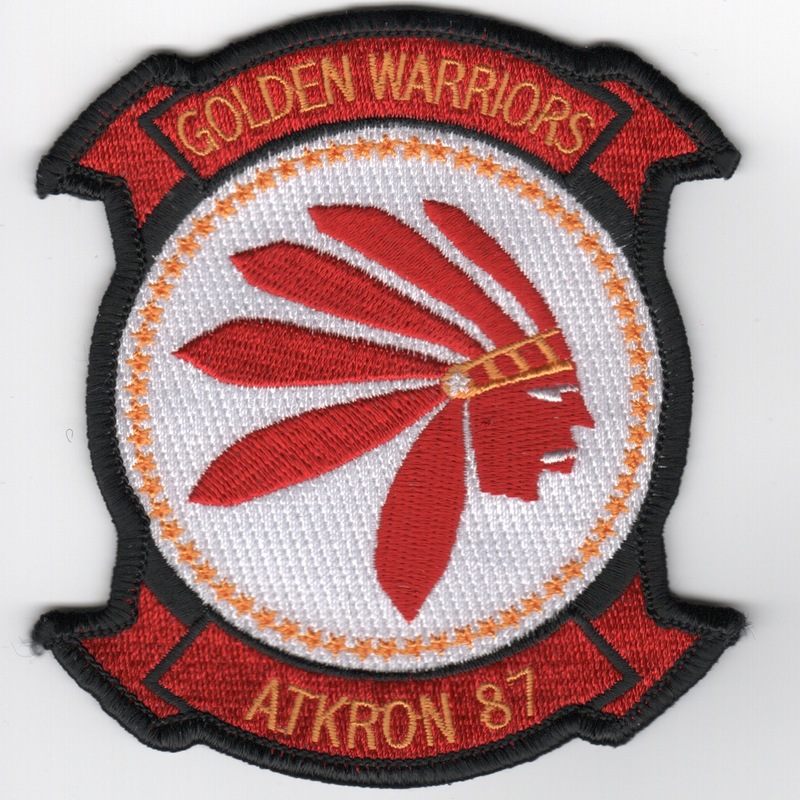 This is the Operation Iraqi Freedom Cruise patch from 2003 for the VFA-87 "Golden Warriors". They fly the F/A-18 Hornet out of NAS Oceana, VA, but during the war, were aboard the USS Roosevelt (CVN-71) as an integral member of CVW-8. This is the Estocin "award" patch created for VFA-87 when they won the Battle 'E' in 2005. Based out of NAS Oceana, VA flying the McDonnell Douglas F/A-18C Hornet, the Golden Warriors of VFA-87 fly as part of Airwing 8 onboard the USS Enterprise (CVN-65). They were established in Feb 1968 and took the Hornet in May 1986. They participated in Desert Storm. I have both red border and black border squadron patches, please specify when ordering if you have a preference. In June 1968, the squadron was established as VA-87, an attack aircraft squadron and the first fleet squadron to fly the LTV A-7 Corsair II, at NAS Cecil Field, Florida. On October 24, 1986, the squadron transitioned to the F/A-18A Hornet and was redesignated Strike Fighter Squadron 87 (VFA-87). On December 28, 1990, following the Iraqi invasion of Kuwait, the squadron deployed for Operation Desert Storm, flying 629 sorties over 43 days of intense combat. On December 28, 1990, following the Iraqi invasion of Kuwait, the squadron deployed for Operation Desert Storm, flying 629 sorties over 43 days of intense combat. This is a reproduction of their squadron patch and does not have velcro attached. Based out of NAS Oceana, VA flying the McDonnell Douglas F/A-18C Hornet, the Golden Warriors of VFA-87 fly as part of Airwing 8 onboard the USS Enterprise (CVN-65). They were established in Feb 1968 and took the Hornet in May 1986. They participated in Desert Storm. This is the color version of the aircraft 'bullet' patch worn on the right shoulder of the flight suit. Based out of NAS Oceana, VA flying the McDonnell Douglas F/A-18C Hornet, the Golden Warriors of VFA-87 fly as part of Airwing 8 onboard the USS Enterprise (CVN-65). They were established in Feb 1968 and took the Hornet in May 1986. They participated in Desert Storm. This is the color version of the plane captain 'bullet' patch worn on the right shoulder of the flight suit. Based out of NAS Oceana, VA flying the McDonnell Douglas F/A-18C Hornet, the Golden Warriors of VFA-87 fly as part of Airwing 8 onboard the USS Enterprise (CVN-65). They were established in Feb 1968 and took the Hornet in May 1986. They participated in Desert Storm. This is the small desert version of the squadron patch. Based out of NAS Oceana, VA flying the McDonnell Douglas F/A-18C Hornet, the Golden Warriors of VFA-87 fly as part of Airwing 8 onboard the USS Enterprise (CVN-65). They were established in Feb 1968 and took the Hornet in May 1986. They participated in Desert Storm. This is the desert version of the aircraft 'bullet' patch. 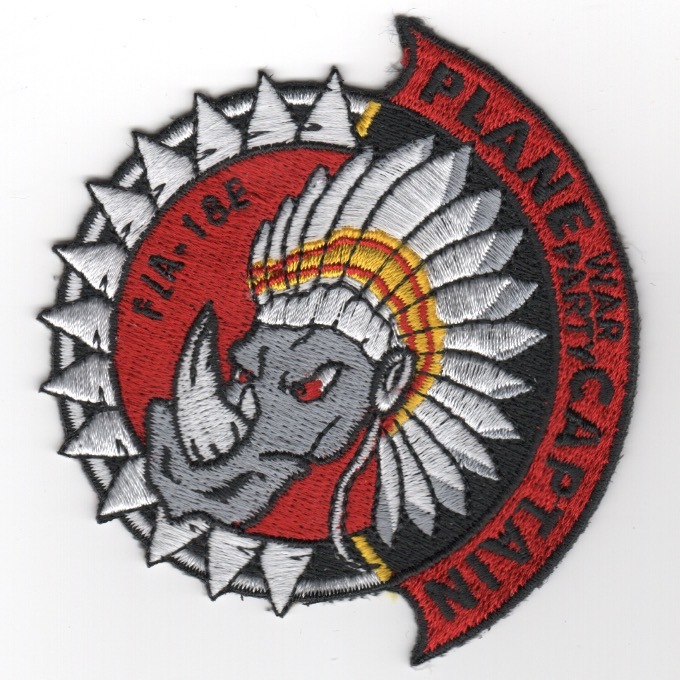 This is the Plane Captain patch worn by those that take care of the "birds" for VFA-87. It depicts the Rhino wearing a Native American "War Bonnett". This patch does not have velcro attached. Homepage | Order VFA-87 Patches!